In 1951, the Czech government decreed that Tatra would concentrate on building trucks, when production of the T-600 Tatraplan was transferred to Skoda. After a year, the T-600 was canceled and it was decided to import Russian ZIS and ZIM limousines for public officials. By 1954 even communist officials were fed up with the quality of the Russian cars, so they approached Tatra designers Frantisek Kardaus and Vladimir Popelar with a request for a domestic luxury car. Both were students of the brilliant Hans Ledwinka, who created the air-cooled, rear-engine T-77 and T-87 before the war, but was imprisoned for collaboration in 1945 and went back to Vienna on his release in 1951. Kardaus and Popelar had secretly been working on a new aerodynamic car already (code-named “Valuta”) that was to be powered by a rear-mounted 3.5-liter, air-cooled V-8 engine. It would have overhead valves instead of the prewar overhead cams, but would still have hemispherical cylinder heads. The body and chassis were ready by 1954 but the engine requirement was bigger than expected, so the 2.5-liter OHV V-8 from the last T-87 sedans was fitted. The year 1955 was remarkable in producing both the Citroen DS 19 and Tatra 603. The teardrop T-603 was designed in a wind tunnel, with three headlights under a single pane of glass. The central light turned with the steering, like 1930s American Pilot Rays. Early cars had a two-piece curved windshield and the rear window design was split by a central spine, like a 1963 Chevrolet Corvette Stingray. Air intakes were designed into the rear fenders. Suspension was by coil springs, with a rear swing-axle, and the weight distribution was 47/53, thanks to the light engine. The front trunk included the spare wheel, which could be released downwards so as not to require luggage removal. There was another luggage compartment behind the rear seat and both seats folded down into a bed. Heat was delivered through several vents, but the engine was designed to run cool, due to efficient ducting. The 2-603 of 1962 replaced the three headlights with four exposed ones, set in a long grille, and the dashboard was changed. The 3-603 of 1968 gained flush headlights and disc brakes all round. The T-603 was produced until 1975, at which point it was replaced by Vignale’s angular T-613, which looked like a huge VW Dasher, and relocated the engine ahead of the rear axle. It became the T-700, and the last Tatra cars were built in 1999. 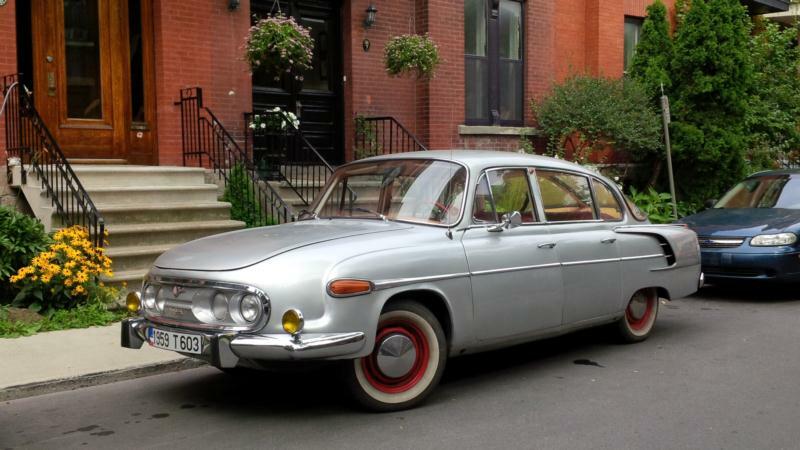 Tatra 603s were never sold to the public, though many were used as embassy cars around the world, and a number were exported to communist countries. With the fall of the Berlin Wall in 1991, a few dribbled out to the West, though they weren’t popular in Iron Curtain countries, as most people had only ridden in them after a 3 a.m. visit from the Stazi. Because of their official nature, T-603s were recalled to the factory for updating and it’s hard to know what year you’re looking at without checking numbers, and details like the dash layout. Spares are problematic, as only 20,422 T-603s were built in 20 years. The T-603’s fit and finish is quite good, and the engine generates 95 bhp, good for 100 mph. The swing axle suspension demands respect, but the cars are generally comfortable and fast. The real bugbear is the four-speed column shift, which is very difficult to operate smoothly. A system of bell cranks goes back to the transmission, while the shifter’s travel is less than two inches from gear to gear, and the gears are back to front, compared to western patterns. Be sure to drive a T-603 before buying one. And if you do buy one, get ready to answer lots of questions.